The Lexio Cloud #2 on copper. I’m shamelessly looking for thumbs so if you think it deserves one, then knock yourself out. Hasbro Dumping Avalon Hill Titles and InventoryAlthough there doesn’t seem to be an official word about the move, it’s the general consensus that Hasbro is dumping the Euro-ish line of games produced under the Avalon Hill umbrella. This includes Betrayal at House on the Hill,Monsters Menace America,Nexus Ops,Rocketville,Sword and Skull,Vegas Showdown. Because of this, several vendors have scooped up inventory and are offering the titles at extreme discounts (75% off). There is a lot of speculation about the reasons for the move but in general, it appears that Hasbro is getting out of the higher-profit/lower-volume Eurogame business since they can make more money on lower-cost/higher-volume runs that sell well in the large chains like Target, Walmart, etc. Several of the titles are supposedly complete garbage but others have had high to mixed reviews from those on BGG (e.g. Nexus Ops). It’s unfortunate for gamers that Hasbro has made the move but more unfortunate is that they don’t sell off the Avalon Hill line to smaller production companies who might be able to reprint and/or produce quality games for those in the hobby. Instead, Hasbro appears to want to gobble up and horde the goods. Hive gets a new bugHive has a new bug on the street with the addition of the Mosquito. This two-piece expansion grants each player an additional piece that is played like all other tiles. Like other creatures it has specific movement characteristics but unlike others, it takes on the movement options of any of the pieces it is currently touching. What an interesting addition! I posed a question to the designer concerning the movement options when a mosquito is used to trap your opponent’s mosquito. The response was that the mosquito cannot move until another tile comes in contact with the trapping mosquito. Although I haven’t played with the new tiles I can already feel my mind churning a little bit (in a good way) about how one would use and/or abuse a piece like that. It sounds like a great addition to an already great game. Himalaya VariantsI ran across some variants of Himalaya that sound like they’d be worth trying. In the standard rules, stupa/religious-influence points are awarded in the same manner as delegate/political-influence points. The large cities award three points, the mid-sized cities two points, and the small villages one point. In one variant you award stupa points using the inverse. With this approach, there is not an all out rush for the big cities when delivering goods. Instead, players must drive towards small villages for religious influence and the large temples for political influence. The second variant applies to the midgame evaluations for the most of each good that occurs on the 4th, 8th, and 12th rounds. The standard rules grants the player with the most of each good (salt, barley, tea, jade, gold) a 3-yak token. 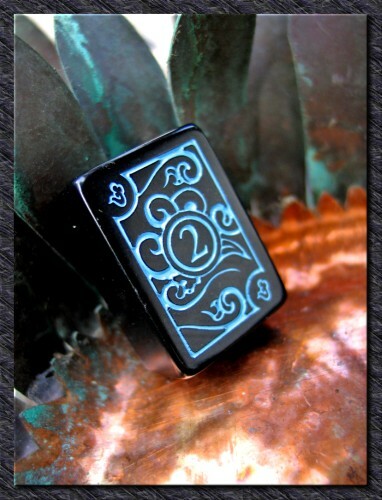 The variant grants the player with a choice from three options 1) a 3-yak token, 2) two delegates placed in any region of their choice, 3) one stupa placed in any region of their choice. I have more concern about playing the game with this variant because it might encourage cube hording during the first half of the game. With the standard game, players are encouraged not to horde if the opportunities for playing stupas are dwindling. With this variant, players can horde cubes and use them to place stupas in locations completely independent of their yak placement. In my opinion, the ability to place stupas and delegates in any location you wish may break the spirit of the game. Our July meeting brought out one of my favorites, Himalaya. We had five players so we christened my copy of the 5/6 Expansion. 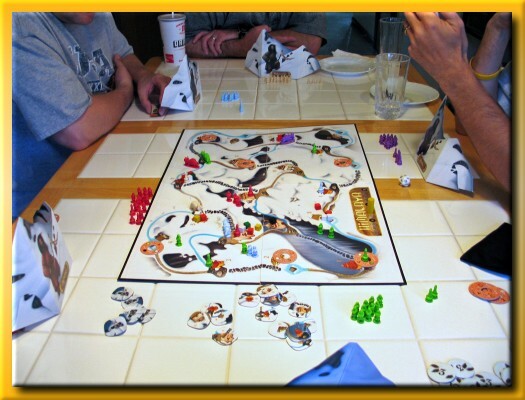 I’m a fan of pick up and deliver games and for me, it doesn’t get much better than Himalaya. 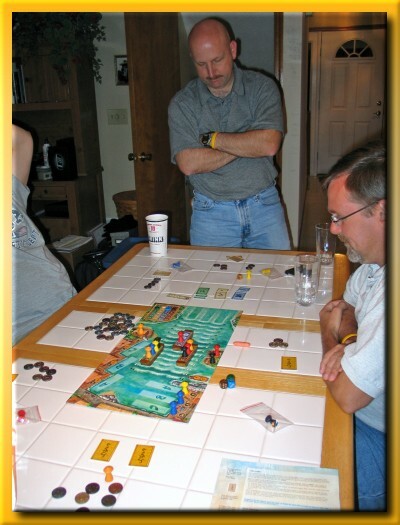 I very much enjoy the ‘programming’ aspects of the game and trying to outwit your opponents. 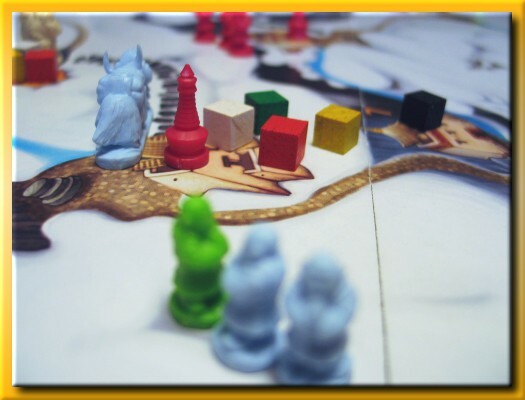 In Himalaya, you have 6 programming chips and each of the 12 rounds calls for you to establish the next 6 moves your yak will take in its quest for goods and order fulfillment. Once you’ve established your secret moves, all players simultaneously expose them to each other. The round is played by circling the table 6 times until all of the moves have been taken in order (no changes allowed!). By the time it’s your chance to take an action in a village, other players may have already taken the action you were hoping to take. To be a good player, you have to be able to 2nd (3rd, 4th, 5th, and 6th!) guess what your opponents will do on their programming moves so that the right goods are available to you and the orders you hope to fulfill are still available when you arrive. The 5/6 Expansion removes the D20 from the game and in its place, you use 20 chips that determine where goods and orders are restocked at the end of each round. Without the D20, you can predict where goods and orders will arrive which factors into where you should position your yak at the end of the turn. The end-game scoring rules are a little difficult to explain given that you must make several ‘cuts’ before being in the running for the winner. If you’re the least influential in religious or political influence, your massive yak herd may prove useless. Next up was Manila. Despite its rather cartoony box art, there is a rather nice game enclosed. Players manipulate the value of shares of four black market goods by driving three punts up a river into the port. Punts that make it, increase the value of the goods that were shipped on that punt. Players ‘bet’ on boats making it (or not making it) to the port by paying to place their accomplices at various locations around the board and on the floating punts. Each location comes with it a built-in payout depending on the likelihood of an event occurring. In the end, it’s all up to the odds of a good or bad dice roll. Monitoring the amount you pay to be harbor master, keeping close tabs on the shares in your hand and the value they have in the black market, and shrewd accomplice placement is key.